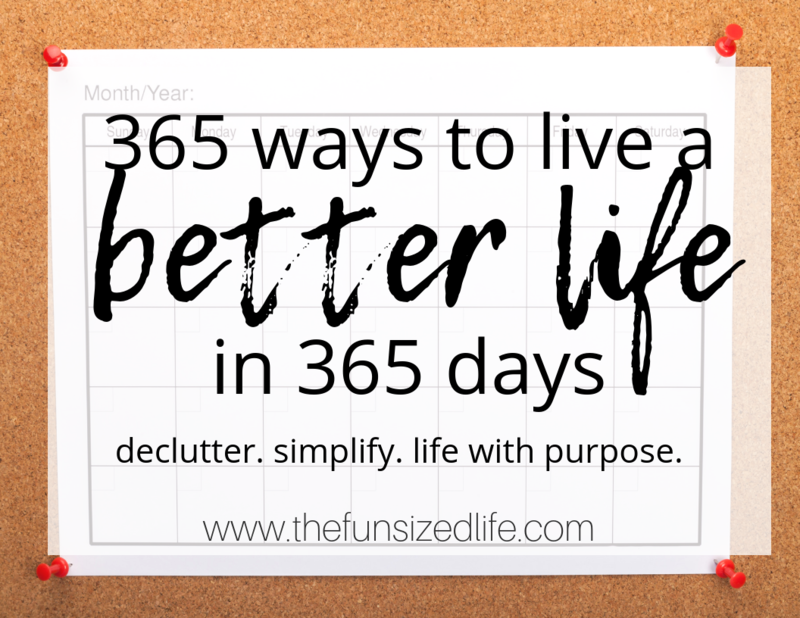 Live a Better Life in 365 Days. Declutter. Simplify. Love More. Live Better. Yesterday is gone. If you are reading this at the beginning of a new year, it’s crucial that you let go of the person you no longer want to be. Living life on a budget is not as stressful as people think. To make it even less stressful, I have created a super simple Fun Sized Budget Bundle just for you! Ditch one bad food item. Often times when people set health and fitness goals they cut out every single food that was bad for them. Usually that doesn’t work. Instead, pick one food that you know is bad and cut that out. Keep at it and then add another bad food on top of it. Sort of like a snowball effect. Plan a recurring date night with your significant other. If you have a significant other, it is crucial to make time for them in your life. A relationship is the foundation of everything a life is built on and if you have one, make sure you are taking the time to nurture it. This is just crucial. You should be drinking half your body weight in ounces of water every day! Stop watching 1 TV show per day. Think about it, cutting one TV show from your daily lineup will easily free up over 20 minutes of time to do something more productive. You can read a book, take a bath, take a nap…whatever it may be. Just make sure you are filling your time with something that benefits you and helps you reach your goals. Erase one thing from your schedule. Chances are you have something on your schedule that you keep saying “yes” to but really it’s burning you out. There is no shame in saying “no” and scratching something off your to do list. Delete one social media app from your phone. This past year I deleted Facebook and Snapchat from my phone and it has been life changing. It is crazy how quickly social media can get away from you if you let it. Say goodbye to one negative person from your life. You might have people in your life that are dragging you down and I want to tell you, you don’t have to let this happen! If you have someone who makes you feel terrible or drains you of your energy, then send them off with love. When you set your alarm, get up with it! I know, it’s hard, but I promise you, eventually you’ll start your day with more energy and less rushing! The latest theory is that people who make their beds are more likely to be highly successful people. Start your day by doing one thing well and it will spill over into all the other areas of your life. Don’t touch your phone for 30 minutes upon waking. It’s tempting to look at your phone as soon as you wake up, especially if you’re groggy. Instead, start taking this time to yourself. You deserve it. Create a get motivated mix. Rachel Hollis suggests making a mix on your phone or iPod that totally psychs you up. A playlist that can totally transform your mood. The key is, only listening to it when you absolutely need it! People tend to rush through their meals. Let me suggest you slow down, chew your food, take small bites and truly enjoy each one you take. There is nothing wrong with sitting in total silence. Trust me. Raise kids for a decade and you’ll understand. Washing your face is such a grown up thing. I don’t know why I didn’t do it sooner. Washing your face at night and first thing in the morning has a way of washing off the old and helping you start a new. Don’t yell in traffic jams. No one likes traffic jams. But maybe you could find a way to make them less terrible. If you feel frustrated, trying taking a few deep breaths, turning on your favorite station and just enjoying the slow, quiet car ride. Because either way you’re not going anywhere. Lay your clothes out the night before. To avoid rushing in the morning, it is a good idea to get your outfit and anything else you’ll need together the night before. That way you are all set to get your day started. No extra brain power required. Instead of hoping to get a workout in, get specific and plan your workout. Plan the length, time and what you will do. This way there is no last minute panic or skipping workouts all together. While you’re at it, set up a coffee date with a friend or family member! It’s always good to slow down and catch up with the people in your life. If you have an area at work or at home that tends to get overly cluttered now is your chance to take it back. If you’re not a perfect human being, you probably have a little “bonus” clutter hanging out in your car. Take a moment to clean it out. Don’t say anything bad about yourself. This is a tough one. I challenge you to take one whole day (and then some) to speak nothing unkind about yourself. You are worthy of so much more than you give yourself credit for. Send 5 “thank you” texts. Thing of 5 people that you could reach out to and just shoot them a quick “thank you” text. People love knowing they are appreciated no matter how small the gesture. Call someone you have been thinking about. Do you ever have those day where you keep thinking about someone? Chances are there is a reason. So give that person a call. Check in and see how they are doing. Buy someone else a cup of coffee. The next time you go to the coffee shop consider buying a cup for the person in line behind you. How many times do you think something nice about someone but never say anything? So, get over it and say something! Take a day, and make it a day of deep breaths. You’ll thank me, I promise. Meditation doesn’t have to be crazy or awkward. It can just be taking 5 minutes out of your day to sit in silence. The best thing I could recommend is trying the Aaptiv app. They have guided meditations that start with just a few minutes. Take a bath or soak your feet. There is something magical about a hot bath. If you’re not a bath person I will settle for a good foot bath. Find a new book to read. Reading will improve your brain power, give you quiet time to yourself and maybe even teach you something. Say 5 things you’re thankful for as soon as you wake up. As soon as you wake up, say quietly to yourself 5 things that you are thankful. It starts your day off on a perfect note and feel free to carry it with you throughout the day. Set a social media timer. Did you know Instagram lets you set a time limit on how much time you spend on there? It’s true I swear. If not, set a timer on your phone and stick to it. Turn your phone on airplane mode at night. Airplane mode not only shuts off notifications but also wifi. Having wifi off at night can actually improve the quality of your sleep and you won’t hear any pinging throughout the night. Go out of your comfort zone today. Make a new friend. Smile whenever you look in a mirror. Yeah, it sounds creepy but do it anyway. When you look at yourself, give yourself a big, toothy, cheesy smile. You deserve it. Now carry that smile with you and share it with everyone you meet. This is a tip as old as time, (or at least as old as elevators.) When you pass a set of stairs make sure you take them. This small, but healthy habit is such a good one to get into. If you are not an avid veggie muncher, then take today and start. Grab a handful of carrots, eat a salad for lunch or broccoli with dinner. Even one serving is a step in the right direction. Podcasts are pretty amazing. Most of them can help empower you, encourage or or teach you something new. Find a podcast and listen to it during your downtime or during a commute. Donate 10 items you no longer wear. Time to downsize and ditch some of your unused clothing! If you are hanging onto those tiny hotel shampoos that you never actually toss out, it’s time to get rid of them. Little things like this are things that you don’t need and no longer serve any purpose for you. Planning your meals ahead of time can take so much time and stress of your plate. If you’re not great at it, don’t worry, try the $5 Meal Plan! National Consumer Panel – When you sign up for National Consumer Panel all you have to do is scan items you’ve purchased and then get rewards like gift cards! Make a Pinterest dream board. There are good old fashioned dream boards that you can make with magazines and poster boards or you can go digital and make your very own Pinterest dream board. Fill it with al the things you want the most out of life. Follow 5 inspirational people on social media. Since we’re going digital, do some searching and find some people on social media who you feel like will help life you up and inspire you. Make a list of your 5 best qualities. Time to talk yourself up again! Make a list of your 5 best qualities and don’t be ashamed of any of them. Have you ever heard of a no spend day? Well, it’s pretty easy. You just don’t buy anything! Whenever you find yourself sitting for long periods of time try an fit a stretch in. Watching TV is the easiest time to do this! Stretch out, take up space and move a little too. They say people can tell a lot about a person by their handshake. Take a day and practice yours. Make it firm, not aggressive, but firm. Figure out your best take charge hand shake and don’t be ashamed to show it off. A lot of times, especially when someone is self conscious the will avoid eye contact like crazy. When we doubt ourselves or feel nervous we skimp on the eye contact. Take a day and knock it off. Say “I love you” at least 5 times today. Alright, time to push your comfort zone. Maybe. When you love someone say it. Take a day and say it 5 times or more. Tell your significant other what you love about them. Now if you have a significant other, take “I love you” a step further and tell them what exactly it is that you love about them. Make time for yourself today. In your busy schedule, I hope you’re making time for you. If you’re not, there is no better time to start than the present. Do you have someone that you wronged or hurt in some way? Even if you don’t understand what it is that they are so upset about, take a moment to apologize. Heck yes, watch your favorite movie. I mean you absolute favorite. You deserve it. Okay, you watched your favorite movie, now take a day and skip the TV all together. Delete 10 songs from your music collection. Time to do some decluttering. Take today to delete 10 songs that you are so over from your music collection. There is something magical about being outdoors. It can feed your soul in more ways than one. Take today and spend 30 minutes soaking up the great outdoors. Get rid of duplicate kitchen utensils. Duplicate kitchen utensils are good for no one. You don’t need them. So ditch them and ditch them now. If you always make dinner and also clean up the mess afterwards then take a day and just knock it off. Reach out to 5 people you haven’t talked to in a while. This doesn’t include Facebook “liking.” If there are 5 people in your life you haven’t talked to in a while, take some time out of your day to reach out to them and see how they have been. No strings attached. People aren’t used to that. Read 6 minutes before you go to bed. Did you know reading 6 minutes before bed can improve your sleep drastically? Give it a try. Start saving your spare change. For a rainy day? Maybe. either way this is a crazy simple step you can take to improve your finances slowly but surely. Don’t use cash much? Check out the Acorns app. It does all the work for you. Eat dinner with the people you love. Maybe you don’t have an immediate family but find people that you love and enjoy a dinner with them. If your mom is alive and well, then chances are she wants to hear from you. If not your mom, an aunt your close with, your dad, uncle. Who knows. Pick that person who gave you their all and give them a call. Maybe I looked up and saw my filthy ceiling fans for this inspiration. Maybe not. If you avoid treating yourself to dessert, knock it off. Today is your day to enjoy that treat that brings you the most joy. Wear your most comfortable pants all day. Think of something you like about your least favorite person. This one can be a tough one. When there is a person you like the least, take a few moments to try and gather some thoughts about what you actually like or admire about them. Via Pinterest, in your mind or for real. Your budget is your business but either way, dream an elaborate vacation of your dreams. Write 5 goals you have for the next 30 days. Narrow your goals down to just this month. What do you want to accomplish. Write down 5 things you want to do. Take a picture of something that makes you smile. Everyone has a camera on hand these days. If you see something that brings a smile to your face, don’t waste a single second and take a photo. Count to 10 when things get crazy. When you feel overwhelmed, stressed out or anxious, slow it down a little an count to 10. Pick a new healthy habit to start. Maybe you workout all the time or eat crazy healthy. Even still, there is something that you can do to make life a little bit healthier. Choose a habit and start today. Chances are you are not doing it enough. Jump in the deep end. Literally and/or figuratively, you decide. Take a leap and jump into something with everything you’ve got. Not gonna say it again. Maybe I will but only because it’s super important. Make time to dance today. Don’t worry, no one has to see. Give those counters a good cleaning. It will only take a few minutes and you won’t regret how good it makes you feel. Do something productive every time you use the microwave. This might sound totally silly but sometimes when I use the microwave I do jumping jacks while I wait. You could run and switch the laundry, or sweep under the table. Take this time and get something done. Wake up 30 minutes earlier. See what you can do with 30 minutes more in your day. Even if it just gives you some time to start your morning off slowly. Be that person. Everyone likes that person. Give something to the homeless. When you come across a homeless person, you may not want to give them food, but maybe a gift card, food, or even a friendly smile. Whatever it may be, acknowledge them and show them kindness. Listen to your favorite band from high school. Because who doesn’t love a little nostalgia? Anything new. Give it a go. Write a letter to someone who has passed away. This one can definitely tug at your heart strings. If you have lost someone who has passed away, take a moment to write them a letter. You may not even realize how much you have been holding in. Go visit a top tourist attraction in your city. People are all about travel these days but chances are you aren’t fully appreciating everything your current city has to offer! Take a day and go all out. Do your hair, your face, dress your best…do whatever you can to make yourself feel as awesome as possible. Scented candles are amazing, so take advantage of that! If you are getting back to back spammy e-mails, delete those suckers from your life. Chances are there is a tiny little “unsubscribe” button in those emails that will set you free. Make yourself a smiley pancake. Remember those? A pancake with strawberry eyes and a bacon smile? Make one for yourself. Just like when you were a kid. It will make everything better. Take a 30 minute walk. Get out and about, move around and take a walk. There is a reason they give animals to people with PTSD and anxiety. They have this amazing ability to instantly lift our spirits. If you haven’t busted out your best board game lately, take a day and do it! Just like animals, (well,ok, maybe not just like animals) children have this ability to bring us back to our youth. Enjoy it. Explore your local library especially if you never have! Sit down and do something totally pointless. Doing something pointless can be hard when you’re used to being on the go. Take a day and try your best to do nothing. At least for a little while. Huge are life changing. They will change your life and those that you give hugs to. See how many jumping jacks you can do. Just give it a try. Like gym class all over again. Something that might even freak you out. If anything you’ll have a story to tell. Make time for your favorite hobby. When life is busy, and you’re working a lot, make time for the things that bring you joy. Inside picnics still totally work but outside is the best. Those albums you have that no one touches anymore? Give them a browse. Scroll to the beginning of your Facebook or Instagram and remember all the photos from years ago. Throw away old photos that no longer serve you. Now that you’ve checked in with your photos, there might be some that didn’t bring a smile to your face. Take some time to delete them or toss them. There’s no shame in it. Eat lunch with a friend. Make a lunch date, call a friend. Check in. Is there someone on your Facebook that you have been wanting to add as a friend? Maybe someone you’ve been hoping to track down? Take a few minutes and do it! Set up automatic deposits with your bank. This one is such a time saver. Not only can you set up instant deposits but you can also snap a photo of any checks you receive and get them instantly deposited into your account! Saves you a trip to the bank! After welcoming new friends and clearing photos, it’s time to delete that one friend. That person who drags you down that you don’t really enjoy having there to begin with. Get rid of old movies. If you have older movies that you no longer watch or enjoy, take today and get rid of them. You can even get money back with for them with Decluttr. You might have a savings account, but are you actually making money with it? The best way to let your money make you more money is by opening either a high yield savings account or a money market account. Cut up a credit card. If you struggle with debt, then just make the leap. Cut up the cards. There might be something you’re missing! See my top recommendations. It will take you like 5 minutes and you won’t regret it! Eat dinner at your table. Maybe you already eat dinner at your table. If not, take time to actually sit down and eat. Go ahead, filter free. I dare you. Electronic free days are the best kind of days. So go ahead and have one. Go to the park today. If you have kids, go run around and play. If you don’t, enjoy the trails, take a walk and soak up some sun. There is probably some scary stuff under there! Stop rushing and move a little more slowly and intentionally. Make small changes to have more wealth. There are a ton of little things you can do that help build your wealth every day. Like opening a savings account, investing spare change, or linking the Dosh app to your cards so you get cash back automatically. Eat only real food today. You will be amazed at how little food you eat that is actually real. I mean grown from the earth. Nothing man made whatsoever. Walk somewhere instead of drive. If you are able to, take a walk instead of drive. You’ll get some exercise and give the environment a little help that it really needs. Spend 30 minutes by yourself. Take some alone time today. You deserve it and you need it every now and then! Chances are you are spending a lot of time worrying about yesterday or tomorrow. Take a day and only allow yourself to focus on what you have control of right now. Let go of 3 pieces of mental clutter. This is coming from a person who loves multi tasking. The thing is, you’re not giving one thing your all. You’re giving a bunch of things a half-assed effort. So focus your attention completely instead of spreading it around. Schedule a day to do nothing. Throw away any uneaten food. Because it’s only getting in your way. Go through your bank account and track your spending. You may be wasting a lot of money on silly, pointlesspurchases. The best way to stop this is to first take notice that it’s even happening. If you have old photos, videos or PDFs taking up space on your laptop, iPad or phone, take a moment to delete them all and clear some digital clutter from your life. This one isn’t quite as simple as avoiding spammy e-mails but it will cut back on the amount of flyers you find in your mailbox each week! Turn off social media notifications. Who needs that constant pinging anyway? It only serves as a distraction from the rest of your life. So turn it off. Write down a goal for your mornings. How do you want them to look? What do you want to accomplish? Even if that just means sitting down and reading with your morning coffee. Set up an automatic savings. Maybe you already opened up a high yield savings account. Now, set up monthly recurring deposits. If you are able to deposit $100 per month you could be earning a 2.25% interest rate with CITBank’s new Savings Builder program! If you have a ton of unused items in your kitchen, get a day where you gather them all up and then donate them. Bullet journals are fun and super easy. They are basically a ways of doodling your thoughts onto paper. Here are some awesome ones. Write a hand written thank you note to someone. Hand written anythings are so rare these days. So change that. Think of someone you’d like to say “than you” to and write them a hand written note. Send someone flowers. For no reason. I don’t like flowers for Valentine’s, my birthday or Mother’s Day but if you send me flowers on some random Tuesday just to let me know you appreciate me…that’s all I need from life. Fill up one garbage bag for donating. Maybe you have a ton of random stuff that you are ready to part with. Grab a garbage bag, fill it up and donate it! There are so many benefits to stretching as soon as you wake up! Go ahead. Give it a try. Do 30 minutes of non-gym related exercise. Maybe that’s gardening, golfing, skiing, or dancing around your living room. Whatever it is find a way to move for 30 minutes. This one can change your life. Declutter your bedroom. Create a place to escape. Your bedroom should be a place of peace. If it isn’t, change that. Don’t be afraid to speak up and ask for help if you need it! The people around you will most likely appreciate that you asked and will feel needed themselves. Schedule an appointment for self care. Maybe that means a massage, getting your nails done, getting that high quality hair cut you’ve been craving. Whatever it is, make time for it. Invite 3 friends to dinner. Write down your 3 biggest weaknesses. Let go of them. We all have weaknesses, what are yours? Write them down and accept them for what they are. Find your top strengths. Hold on to them. Now it’s time to focus on those strengths. I highly suggest this book for everyone. Chances are you don’t even really know what your strengths are. Go see a movie and get popcorn too. Treat yourself to a movie and indulge on some snacks too! Get yourself a water bottle. You should be drinking more water and if you haven’t yet, get yourself a water bottle so it’s even easier to get in all that H2). Look up crock pot meals. Crock pot meals are sooooo fantastically easy. So gather some crockpot meal ideas and start working them into your routine. No one really likes cleaning the microwave. So why not avoid the mess all together and just cover your food whenever you microwave it? Plan your exercise for the week. Maybe you are getting good as setting aside a time to workout but do you know what your workouts are going to be? Plan out each day so you can make the most of them. Try the KonMari folding method. Using the KonMari folding method can save you so much space it’s insane. Make a not to-do list. You probably have a to do list. Today make a list of stuff you will not do. Maybe things that distract you or stuff you are struggling to quit. Do the bare minimum today. Just wash your face, get dressed and head out the door. Skip the primping and prepping. You might really love it. Try journaling about your day. See how it goes. Stop talking behind people’s backs. Just see if you can. New things are always good to learn! So keep at it. Set your goals with a sheet of paper. I absolutely love Warren Buffett’s super simple method for figuring our what your goals are in life. All you need is a piece of paper. Schedule nothing for one whole day. You’ve done nothing for a day how about a day where you just do less. No appointments, no major plans. Pay attention to what makes you anxious. When you feel anxious pay attention to what triggered it. This could tell you a lot about yourself. Get in some fruits and veggies and get inspired with some meatless dishes. Find a way to treat yourself. Whatever that may look like. If there is a place in your house that is over-flowing with clutter. Take a day to organize it. Write down 3 goals for your day. Each day pick 3 goals that you want to accomplish. You can’t get everything done, but stick to just these 3. Just like when you were a kid. Who needs adult coloring books. When you are wrong, don’t be ashamed to admit it. Try a workout that makes you nervous. Trying new things is nerve wracking especially when it comes to workouts. Pick one you really want to try and give it a go. Say “hi” to someone new today. Someone you’ve never spoken to before. Go ahead. Buy a random stranger dinner. Walk into a restaurant, pick a table, pay for their dinner. Walk away. It feels pretty awesome. Fresh baked anything is a natural mood-booster. Do 10 minutes of yoga. Yoga has a great way of stretching us, challenging us and encouraging self acceptance. Give it a try for just 10 minutes today. Because they probably need it. Whether you play one or not. Harboring resentment is only hurting you. Create a travel Pinterest board. Gather all of your best travel ideas in one place. Even if you just need some time to treat. No speeding for one whole day. Can you do it? Put a Dollar Store garbage basket in your car. Quit letting that garbage take over. Create a gift basket for someone who needs it. Put together a gift basket and leave it on someone’s door step. Throw away anything that is broken. If you have broken stuff and it’s not fixable, then toss it out! Pick up everything before you go to bed. A completely clean house first thing in the morning? Yes, please. Pick a favorite quote to live your day by. Do you have a quote you love? Try incorporating it into your day! Buy 3 friends gift cards. Treat people to some gift cards. Get $25 for $10. Use that savings from Restaurant.com to take yourself out to eat at a new local restaurant that you haven’t tried yet. Avoid using things like napkins, paper towels, straws, paper plates and plastic cups. Purchase something from a friend who has their own business. Make their day and help a friend. Somehow these take over everyone’s life am I right? Your local library would probably love to take them off your hands! Leave an uplifting comment on your least favorite persons social media. Send love to that person you don’t like a lot. This is how the world will change. Hug everyone in your family. Twice. Maybe you don’t pray. That’s fine. How about just speaking your gratitudes out loud? Write 3 positive words on your bathroom mirror. Just don’t use permanent market! Tell your family members what you love about them. Pick a place and lend a hand. Just try not to be awkward about it. Park far from the building. Leave those close up spaces for people with kids and disabilities. The walk might do ya some good. Get a reusable shopping bag. Quit adding clutter and using plastic and bring your own bag to the store. What do you want to achieve in life? Does it require an investment? Then do it! Leave $5 in a library book. Just a fun little surprise for the next reader. Find something fun to do that’s totally free. There are so many things you might be missing out on. Get a debt payoff plan. If you’re in debt, make a plan to get out of it. Now. See how we paid off $6,000 in 6 months. Don’t say anything negative today. Everyone should have a $1,000 emergency fund. Here’s some ideas on how to get it. Donate any clothes that no longer fit. Whether they are too big or too small, let them go. Move on. Embrace who you are today. Reach out to someone you can learn from. From a Farmer’s Market if you can. Get off the phone when with other people. If you have company, get off your phone. Don’t be that person. Explore a local small business or check one out online. Clean out your jacket pockets. Maybe you have cash you forgot about…maybe it’s full of garbage. Either way, it’s beneficial. Check in with your spouse. How are they doing? How are you doing? Make sure you keep those communication lines open. Replace a bad habit with a new good one. Do you bite your nails? Try strumming your fingers instead. Smoker? What about replacing it with gum? Make a list of 3 small things you can do to reach one big goal. If you have one big goal, chances are there are three small things you can do to help you get closer to it. No one does this anymore. Sometimes it pays to wait. If you instantly feel like panicking or getting angry…try to slow it down. Assess the situation and don’t be so quick to react. Whenever you have a negative thought, try to acknowledge it and figure out where it’s coming from. Plan a fruit or veggie snack. Get in those good foods by planning them out ahead of time. Stretch every hour after sitting. If you spend all day at a desk make sure you are taking time to stretch it out every once and a while. There is no better way to lift your spirits. Who needs new furniture to spice things up? Just rearrange what you already have. Unfollow people who make you feel bad about yourself. This might mean that super beefed up hottie who looks awesome in a swimsuit. You might love them but if you feel worse after looking at their page, then block or unfollow. Focus on you. If you get a compliment, just say “thank you.” don’t tell them all the ways that they are wrong. Try time blocking for productivity. Schedule your day with time blocking. Spend some time with the people that you love the most. Look up the meaning of your dreams. Do you have a recurring dream? Look that stuff up on Dream Moods. You know those pretty green plants that you can’t kill? Buy those! Put your oven on self-clean. It’s like you cleaned but you didn’t have to! Listen to a new radio station for 10 minutes. Switch it up. You might surprise yourself. Pick a positive word and repeat it all day. Try essential oils in the shower. Let some essential oils steam up your shower with you. Something like lavender will calm you down. Call your server by name. Whenever you go out to eat or get coffee, try to use your servers name. They are a person after all. Clean our your purse or wallet. So weird I know. But hey, it’s you we’re talking about. This is 100% who you are. Embrace it. You may want to shout all your good deeds from the roof tops or brag about yourself when you did something good. Don’t do it. Be humble. Use my free Simple Fitness Checklist to track your healthy habits like water and veggies. Organize your pantry or cupboards. It will make you smile when you’re done. Promise. Sent 5 voice texts to encourage others. Voice texts are amazing. Send some encouraging ones to those you love the most. A forced smile can actually cure little bouts of crabby. See what you’re really made of. Tell that person who inspires you that they inspire you. Let them know. It will totally make their day. Who can you learn from the the most? Find them. Completely screen free. What will you do with yourself? No one needs it anyway. Eat what you feel like. Pay attention to how much your body says you need. Get prescriptions sent to your home. No one likes that added trip to the drug store. Get your prescriptions sent to you for free with PhilPharmacy. It’s easy to put other fist. Don’t forget about you. Listen to your favorite love song. Tell your body you are thankful for it. Don’t cut it down. It’s the only one you’ve got. Talk to your spouse about your finances. If you aren’t doing this. It’s a must. Here’s some tips. Plan one smart financial move you can make to better the rest of your year. Get out of debt? Start a savings? Cut the cable cord? What would change your financial world? Think of what the hardest time in your life gave you that was good. It’s easy to be mad about the hard times. But what good came from it? Write out your “dream” obituary. So weird right? What do you imagine being said about you at the end of your life? What do you want people to remember. Live that way. Wake up and make a list of what you love about your job. You might complain about it but do you ever take a moment to be thankful? Pick up some extra when you’re at the store. Leave it as a food shelf. Easy. Write 10 of your biggest life accomplishments. When you feel down about not being as far as you want to be. Make a list of all the things you have done already. Find 3 hilarious YouTube videos. Because who doesn’t like to laugh. People don’t write enough of them. It actually has healing powers. You can do it, I promise. Try to stop saying, “love” unless you actually mean it. Don’t overuse this word. It makes it far more special when you say it. Donate to a random Go Fund Me. Pick a cause you believe in or a disease that has affected your life. Donate to someone else’s struggle. Write someone a letter. An actual letter. Go above and beyond a thank you and give them a full page. Write down 5 things you want as if they have already happened. Write down your dreams like they already took place. Your brain will believe you. Let it relax you at the end of your day. Lay under your covers when they’re fresh out of the dryer. I mean, people are getting paid for this. So do it for free. Read a self help book. There are so many good ones. Drink your water before your morning coffee. I know, again with the water. But it’s so good for you. Show up 10 minutes early to everything. Trust me, you want to be that person. No one else might know but you will. Because you really do only live once. Repurpose something in your life. Give old furniture new life or fix up that old blanket. You don’t always need to buy new stuff. It will save you so much time! Plus, who doesn’t love pancakes every morning? Have someone get your groceries. This is a thing now! Try Instacart, Shipt or check the options at your local stores! Plan one way you can reduce the time you spend cleaning. Research if you are living above or below your means? Only 50% of your paycheck should be going toward your cost of living. Where are you sitting at? Say “hi” to your neighbors. Especially if you haven’t yet. Set up recurring orders on things you buy. There are places that you can set up recurring monthly orders. Like Chewy for your pets! Plus, you get a discount when you set up recurring orders! Try to make money from a hobby. If you have a hobby that you love, is there a way you could make money from it? Like me an blogging I mean… See how it’s done. Salsa. Cooking. Robotics. It’s totally up to you! Go ahead, give that Pinterest recipe a try. Paint a room in your home. It’s amazing what a little fresh coat of paint can do. Don’t just hear, but really listen. Stop thinking about what to say next. Just listen. There is no guarantee that someone else will. Put the cart back in the cart corral. This is just being a good citizen. Google quotes about your biggest struggle. Write the three best ones down. Do you struggle with procrastination? Google some quotes that motivate you to get up and get going. Who cares if someone sees. Look into passive income ideas. Making money in your sleep is a thing. Take advantage of it. 14 Passive Income Ideas. Do you ever talk bad about something someone else is doing? Even if it doesn’t really affect you? Chances are, there might be a little jealousy behind it. Pay attention. An put your elbows into it. Write a letter to your spouse. See this letter theme? It’s so much more personal and your spouse deserves one the most. If your fire pit or fireplace are going unused, it’s time to break the cycle. Don’t sit in your regular seat. If you sit in the same place at church, on the bus or even at the movie theater. Branch out and switch it up. Create a reminder for the thing you want most. Jim Carrey wrote himself a check for $10,000,000 and held onto it for years. After Dumb and Dumber, he cashed it. What could you make that reminds you of your goal and keeps you aiming for it? Don’t look at other people’s bodies. Comparison is the thief of joy. If you are comparing yourself to someone else. It’s not serving anyone. Encourage 3 people whose lives are different from yours. It’s hard to understand other people’s struggles when they are different from ours. Instead of judging, send the encouragement, even in your mind. Donate old blankets to a homeless shelter. Plug one nostril breath in the other and then breath out. Now switch. It wakes up your brain and calms you down. Give yourself a tennis ball massage. It’s basically free and it feels so good. Put your dirty clothes in the hamper. The floor is for walking on after all. At home. At the store. Heck, even hang onto your recyclables until you get home. Put phones away at dinner time. Let someone else do the work for you. Listen on your way to work or at the end of the night. We’ve all gotten gifts that we don’t use. Donate them instead. Think of what you’re holding onto that you could let go of. Mental clutter? Actually clutter? Whatever it is that you’re holding onto, it’s time to let it go. Try out a capsule wardrobe. It clears space and makes getting dressed easier! See how to start. Make dinner for someone in need. Home cooked meals are amazing. Give this gift to someone who could use one. Post only uplifting things on social media. Social media can be used for good or evil. Choose good. Lift up those who follow along with you. Embrace other people’s way of life. It doesn’t have to be the same as yours. Don’t make any unplanned purchases. This just leads to trouble. Grief doesn’t have to be the loss of a person’s life. It can be losing a friendship, relationship, or even dropping your ice cream cone onto the street. Whatever the case, allow yourself to grieve. Give gifts to those who you forget are helping you. People like the mail man, child care workers and janitors make our lives so much better every day and yet they rarely get thanked for it. It can actually be really good to take a day off. See how. Because sometimes you’ve gotta live life on the edge. Do a chore you don’t normally do. Surprise the people you live with and do a chore that you don’t normally do. It will lighten someone else’s load. Start up your favorite childhood past time. What did you do as a kid that you don’t do anymore? Something fun. Do that again. Bring some kids to the park, your kids, nieces and nephews. Whoever. And play tag, run around, swing on the swings. Go crazy. Congratulate someone you are jealous of. Own what brings you joy. Only own things that enhance your joy and happiness. Create a 5 minute clean up jar. Write down chores that take 5 minutes and put them in a jar. Then throughout the week, grab a chore and do it. Above all things, be kind. Don’t let money stop you from living. Don’t let debt hold you down and don’t get so consumed with paying off debt that you stop living your life. Try one color scheme living. Pick 3 colors for each room and stick to them. It makes things so much more simple. I love pink and yet I rarely wear it. How silly is that? Decorate your home with what you already have. You don’t always need new things. Sometimes you just have to get creative with what you already have. Set a 5 minute timer and write down every single thought that comes to your mind. Were there any recurring themes? Pick one thing to focus on. Pick one goal. One main focus. Stick to it. Whatever you struggle with the most during your day. Do that first. Now move on. Paying for help is ok. Sometimes you can ask for help, sometimes you need to pay for it. Maybe that means getting a maid once a month or even having someone plan your meals for you! You can organize all day, but if you have too much stuff to begin with, nothing will ever be organized. This really works. Pretend you already are who you want to be and you’ll find yourself getting there more every day. What can you stick to for 30 days? Is there something you’ve been struggling to do or accomplish? Well, set a goal to stick with it for only 30 days. Lifetime goals can be crazy overwhelming. Follow through on anything you start. Before making any big life altering decisions, take a day or two to really think it over. Not on food. That’s ick. But really take in all the things that benefit your life. Soak up sunshine, soak up family and friends. Binge on all things joyful. Now get rid of all the bad. Ditch the clutter, say goodbye to negative thoughts. Get all the stuff that drags you down out of your life for good. You have 364 new ideas, pick the ones that work for you and stick to them!